THE WICKED SIDE OF WIZARDRY ? Cute girl wizard Lucy wants to join the Fairy Tail, a club for the most powerful wizards. But instead, her ambitions land her in the clutches of a gang of unsavory pirates le by a devious magician. Her only hope is Natsu, a strange boy she happens to meet on her travels. 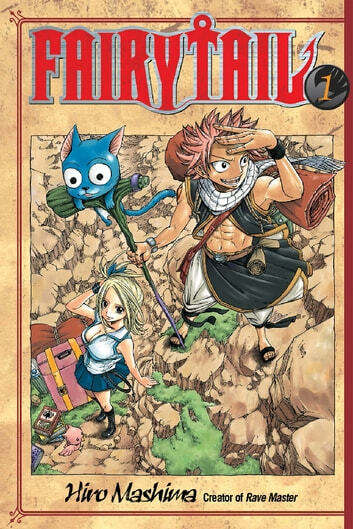 Natsu's not your typical hero - he gets motion sickness, eats like a pig, and his best friend is a talking cat. With friends like this, is Lucy better off with her enemies? This is an incredible especially for newcomers to the genre of anime and manga as it represents the best qualities of the genre. Which i beleive to be the following: great character development, creative concepts and arstyle. I would reccomend this or its anime counterpart to anyone who enjoys fantasy titles or the creations of the anime industry as a whole. A great book for someone just starting to read manga as it is easy to follow both in plot and design. Once you start it’s hard to put down. This Seires is the BEST! Fairy tail is awesome! I LOVE this seires!! .. I seriously think this is really wierd... Well, its okay, but i cant exactly say that i enjoyed it. Non vedo l'ora di leggere il prossimo!